I recently came across a Nigerian blogger program via NigerianBlogAwards.com and I was quite impressed so I decided to do some research into it and blog about it! So I did some more digging into the Fidelity Blogger program and so far, here are some of my findings. "...Is designed to equip bloggers to reach their highest aspirations by providing a pool of resources on a wide variety of subjects." I thought this was rather vague and personally, I won't really sign up for the program after reading that. What exactly do you want from me as a blogger and what do I stand to gain by joining? After some more digging around I found they offers competitions such as the Creative writing competitions (which doesn't say much on the website, again but there's more here) and the option for product reviews, which is fine, however, I'm a little surprised I couldn't find anything about this on their website? 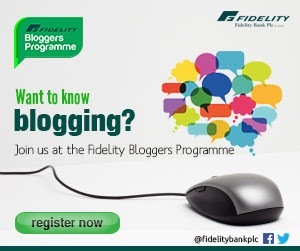 Don't get me wrong, I applaud Fidelity bank embracing bloggers and all, but I think I'm still a little confused about what exactly is in it for them? Because there is always a catch, I believe it needs to be a two way street. I understand they want to share press releases with you if you if you sign up but if I'm a fashion blogger why would I be interested in sharing press releases about Fidelity bank? This brings me to my second point? I'm thinking an initiative like this would be much better if it targeted a specific niche - financial/news niche to be exact. That way the bank knows they're focused on building relationships with bloggers that are relevant to their business. For instance, I as a mummy blogger would love to work with a brand like Pampers and Mothercare because that is what I blog about and I know my readers would be interested hearing about news and products about such brands. And something else Sainsbury do brilliantly is to integrate their blogger network into the main Sainsbury website! This means all the link remains within the main website and doesn't get passed on to a subdomain (and sort of gets lost as sub domains are regarded as separate domains). I've blogged about sub domains vs sub folders a while back, so that should help shed more light. All in all, I think it is a very good initiative and I'm curious to see how it pans out with their blogger program strategy. I hope they use it effectively to generate some great backlinks for their website especially as they're currently not on the first page for a number of relevant banking keywords in Nigeria! Well done Fidelity bank and good job with the Content Marketing (right?) strategy! What do you think? Do you have other examples of Nigerian blogger programs and networks run by business? What other companies are embracing such Content strategies and idea? Please send them my way, I'll love to have a look to know what's going on! I've got my facebook page which is another way to get updates about my blog. So please 'like' my Tola SEO page or follow me on twitter! And please vote for my mummy blog 'Stepping into Motherhood' for Best Parenting/Family blog in the Nigerian Blog Awards! Thanks!